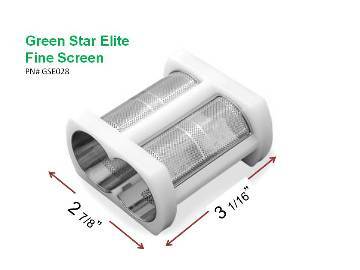 The Fine Screen is designed for us with the Greenstar Elite GSE-5000 juicer. It features very small openings to allow as little pulp as possible in the juice. This screen is the one that comes installed on the Green Star Elite GSE5000, GSE5010 (Black), GSE5050 (Chrome) or GSE5300 machines. This screen is suitable for most types of vegetable and fruit juices, including carrots and other root vegetables; crisp apples and other crisp fruits; spinach, kale, and other leafy greens, wheatgrass and other grasses, celery and other fibrous stalks, and much more. Note that the pressure built up inside of the screen may still push some finely ground pulp through the holes of the screen.